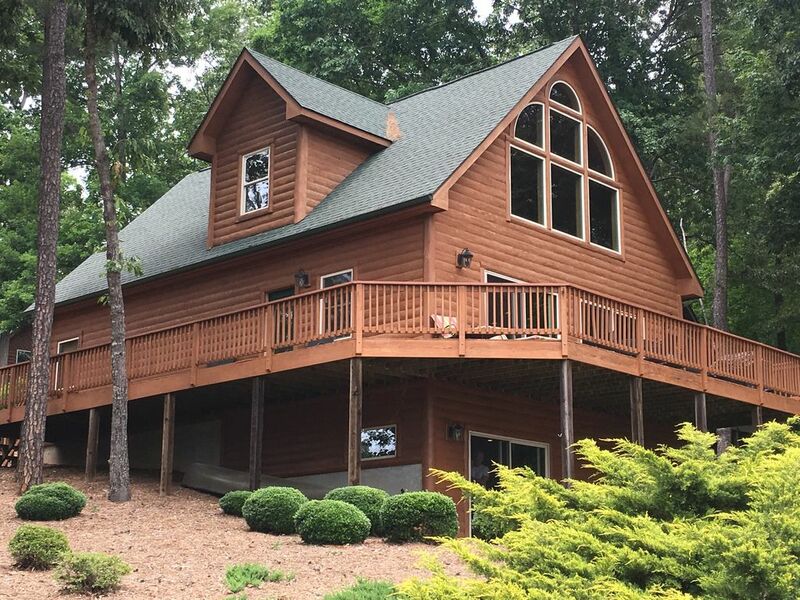 Modern Cabin Beautiful Views of Lake Keowee!!! Near Clemson!! If you are looking for a relaxing getaway with beautiful lake views, this upscale cabin is the place for you. Best view is Serenity Bay!! Located just minutes from Clemson University this home has a two story great room with stack stone fireplace, and gourmet kitchen. You will find great views of the lake on all 3 levels of the house, especially on the deck which has a gas grill for cookouts. The master bedroom is located on the main level and it has a king size bed with Jacuzzi tub in the master bath. The upstairs level has a 2nd Master bedroom with a king size bed/Bathroom and it walks out to a loft area (sleeper sofa) with spectacular views of the lake. A game room w/ wet bar and 2 additional bedrooms are located in the terrace level which allows the house to comfortably sleep 10 people. Additionally, the terrace level has a large HD TV, couches& ping pong table. You may also walk out of the terrace level. A canoe is included with the rental which will allow you to explore the quiet cove around Serenity Bay. If you are interested in boat rentals they are available at the Lake Keowee Marina. The Blue Ridge Mountains serves as the backdrop and Lake Keowee the centerpiece of this beautiful setting. There are 18,500 acres of water and more than 300 miles of shoreline. Lake Keowee provides a wonderful opportunity to enjoy nature. If you enjoy water sports you will love the sailing, boating, water-skiing, canoing, whitewater rafting and fishing. The area is surrounded by thousands of acres of protected land with six state parks nearby and located with access to two of the most pristine lakes in the Southeast, Lake Keowee and Lake Jocassee. Golfers will enjoy the various public and private golfing options available around Lake Keowee. Community Boat dock available for swimming off of and to tie boat up daily, however boat has to be stored @ Crooked Creek RV Park. Boat ramp and trailer storage for use coveniently nearby at Crooked Creek RV Park. Boat trailers are not to be stored in subdivision please; nor are renters to use community boat ramp per HOA. We had a wonderful time and would highly recommend this place! Great family weekend near Clemson! Beautiful views of the lake! Quiet community. This cabin is in fantastic shape and has all the amenities you need for a family getaway. Plenty of room, well stocked kitchen, ping pong table and video games for the kids. Only 30 minutes from Clemson which allowed us to take in a game while visiting our daughter. Would absolutely rent this cabin again! Thank you for a relaxing weekend! Thank you for the nice review and I hope you come back for a visit again!! Picturesque view, fantastic accommodations, Clemson win. Perfect weekend! Wonderful long weekend with Florida, North Carolina, and South Carolina family members. Perfect location for access to the Clemson game. Great house with everything we needed. Loved all of the black & white family photos. Thoroughly enjoyed our Fall getaway! Glad you enjoyed our house and got to celebrate a Clemson victory with your family!! The house was great and anything we needed was already there. We were surprised that the silverware in the drawers was not clean. Maybe we were expecting too much, however the floors and bathrooms were not very clean either. We did not have a bad experience, we enjoyed our time. The cost was very reasonable for the space we had. Will definitively go thru VRBO again for our next trip. Thank you for staying at our house. I apologize for the cleaning issue and we have addressed this with our maid service. If you stay at our house again I'm sure it will be very clean. Our family had an amazing stay on Lake Keowee! The house provided the perfect space to accommodate our family of 7. Would love to stay here again in the future! Thank you for the review and we are glad you enjoyed your stay!! Awesome vacation and a fantastic house. Totally enjoyed our stay and would definitely rent again! Thanks for staying at our house!! Pets are allowed if the owner agrees to the kind of pet and size with a Non-Refundable Pet Fee. The 3% Credit Card fee if not taken when payment is made will be deducted from your Damage Deposit.